Nelson Pinos thought he would only be able to watch Flor de Toloache and Las Cafeteras play New Haven through a video screen. Instead, the concert came to him. Pinos is an immigrant living at First & Summerfield United Methodist Church, where he has been seeking sanctuary from Immigrations and Customs Enforcement (ICE) since the end of November. Flor de Toloache and Las Cafeteras are both fiery, fusion bands with Latin and activist roots and bold lyrics. Sunday night, their worlds collided in the church’s bright sanctuary, where they played a 40-minute mini-concert specifically for Pinos. 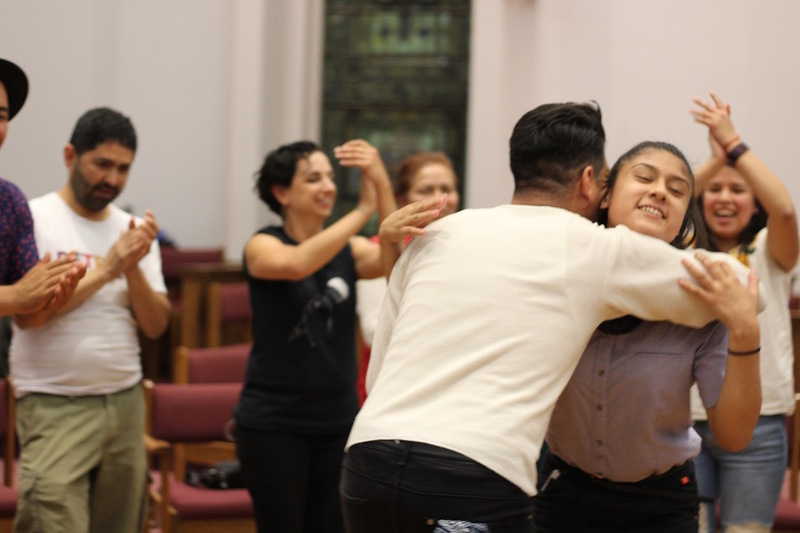 Twenty or so activists, most from Unidad Latina en Acción (ULA), stayed at the church for the event. The groups were in town to play the International Festival of Arts & Ideas on the New Haven Green, the second in a lineup of free public concerts downtown. But as they geared up for the show, they got a call from ULA founder John Lugo, who met Las Cafeteras at a rally for Nury Chavarria last July. The band, which has been playing rallies and protests for years now, jumped at the opportunity. As they played their main show on the green, Pinos said he alternated between watching them on Facebook Live and from the top floor of the church, where a window provides a partial view of the New Haven Green, and strains of music floated down the block. He listened as they gave him a shoutout, drawing applause and cheers from the crowd. He took in the concert in as they sang passionately about the need to get rid of borders—their tag line is “Yo No Creo En Fronteras”—and support immigrants and refugees across the country. Then he got the news that the band had decided to play an encore—that he could see and hear up close. ULA Member and NHPS Advocate Fatima Rojas lets the music take her. He added that he hasn’t had to be strong alone, which has kept him going. On a near nightly basis, at least one member of ULA heads to the church to stay the night, in case an emergency happens and an organizer needs to be on hand. Sunday was just a bigger nightly group, as ULA’s regular crew headed over from the green. As members gathered in the church around 9:30 p.m., they snapped into organizing mode, calling an impromptu meeting on a recent online petition that is asking President Donald Trump to pardon four East Haven Police Officers. As they waited for the band, Lugo gave details about the group’s upcoming plan of action, including a rally in the coming week. They didn’t have long to wait. As Lugo spoke quickly, ULA member Megan Fountain translating for him, a few attendees fixed their attention on the bodies slipping through the front door. Skipping dinner, members of both bands had headed straight from the green to the church, rolling in just slightly after 10 p.m. Playing their way into the sanctuary, musicians gathered around Pinos and his family, embracing him and forming a sort of loose, not-quite-round circle. From the right side of the circle, vocalist and musician Denise Carlos recalled growing up in Los Angeles with parents who were both undocumented until she was in her teens. She looked directly at Pinos’ son Brandon and daughter Kelly, telling them that she knows how scary it is to live in fear that your parents will be taken away from you. She pledged that whatever the band could do for Pinos and his family, it would. In the center of the circle, French and Jorge Mijangos were already halfway there, easing into their Jarana and Requinto as Flores hopped in on vocals. From the band flowed the Son Jarocho style of music, full-bellied and flecked with zapateado dance from the region. As they strummed, voices from the group a rising tide of sound, members drifted into the circle, dancing as they added vocals and rhythmic, propulsive clapping. On the perimeter, attendees clapped but remained seated. Feet beat the floor in unison. Flores with Pinos' daughter, Kelly. Flores announced that the group was just getting started. Inviting attendees into the center to dance, he launched a remix of the band’s “La Bamba Rebelde,” band members waltzing into the circle with their mouths open, hips rocking to the beat. Inside the circle, attendees formed a tent with their arms, still wiggling their hips as dancers crouched and filtered through. Around them, Flores spun though the space, making time to dance with Nelson and his kids. Vocals faded into strings, then returned as long and piercing threads of sound. Carlos jumped back in, her arms waving as she added a butterfly to the song. Her pink hair was electric in the sanctuary’s light. Activists-turned-dancers cheered, still moving as they directed their attention toward her. Denise Carlos breaks it down. She held forty pairs of eyes, pulling the room in with her voice. Then she let it go. The strings took over again. “Ay, ay, ay, ay,” attendees cheered, jumping up and down as they raised their arms. The floor shook as feet landed, then lifted off again. Slowly, Pinos joined in, raising his arms over his head He ventured closer to the center, pumping his arms and stomping his feet as strings swelled beneath him. Just moments before, he’d done the same as the crowd had taken up a different cheer—his name. “Nelson! Nelson! Nelson!” dancers had cried, urging him into the center of the circle. As he danced, attendees cheered and trilled their tongues, celebratory even in the face of his six-month anniversary in the church. The music wound down, attendees shimmying to the floor and back up again before a final, triumphant round of sound. Then the room fell back into silence, with a low hum of chatter. "I want to thank all of you who do this work [fighting for justice for migrants]," said Flores in Spanish, placing his hands over his heart as he spoke. "We sing about the struggle because we come from the struggle." "We have parents who were born in Mexico who crossed the border without papers," he continued. "My father did not have papers when he got sick three years ago and he died." Luis Luna hits the dance floor. "Brother, with love, with affection, we wish you good luck. We stand with you. We will use our platform to support you." "Tonight we give you nothing more than a song and a little dancing, but we give this from our hearts to heal your soul," added Carlos, emotional as she spoke. "And you have the whole community standing with you and your family. And the story of your family is changing. We are all your family now. We are all family." "Thank you from the bottom of my heart," Pinos began in Spanish. "Thank you for coming to this change church to meet me. You have done the most important thing that anyone could do, which is to bring joy to my heart, and ..."
His voice caught, and looked at the ceiling and took a deep breath. “Te queremos!” ("We love you!") someone shouted from the circle. “This is a very difficult time,” he said. His daughter Kelly scooted over to give him a bear hug. “Fuerza hermano, fuerza!” came another voice from the circle. Pinos looked across the room, and raised his first to the sky. "Sí, se puede!," chanted the group. "Sí, se puede! "Thank you so much," Pinos added as the chants subsided. "The music that you shared with me tonight is the greatest support that anyone could provide. It is more than money could buy." To watch full live coverage from the event, click on the video above or visit The Arts Council of Greater New Haven on Facebook. Very special thanks to Megan Fountain for translation help.